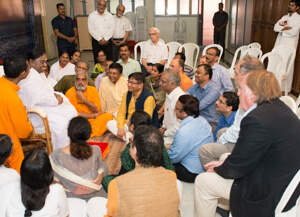 Amma met with 25 speakers from Amrita Samyogam – the International Conference on Integrative Medicine that was recently hosted on August 6th and 7th at the Amrita Institute of Medical Sciences in Kochi. 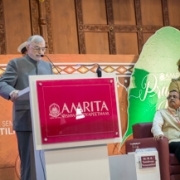 This was the largest conference on Integrative Medicine held in India and the delegates and speakers came from many parts of the world to discuss ways whereby practitioners and researchers in the fields of modern medicine and Ayurveda could work together. 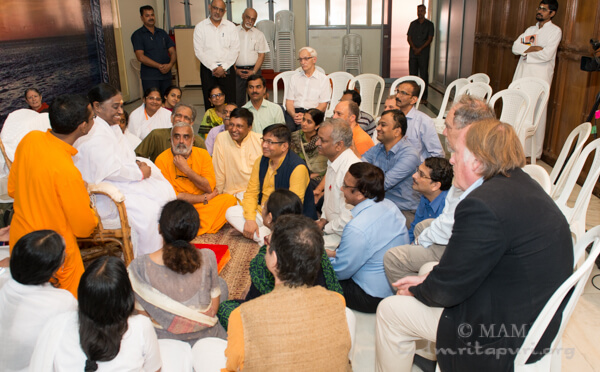 Amma spent almost two hours interacting with the doctors on this morning when they came to Amritapuri for a visit. 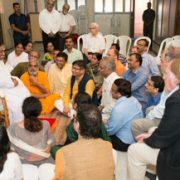 Amma began by saying that she was neither solely for Ayurveda nor solely for modern medicine but that she wants only is what is best for the patient. A renowned scientist from California, Dr Daniel Furst, expressed his concern that many in the field of Ayurveda were not in favor of further validation or proof of their treatment outcomes and asked what should be done. Amma gave a beautiful reply that traditional therapies were combinations of many ingredients often mixed with oil. She continued that such therapies came from the inner vision of ancient sages and felt that it is very difficult to study such complex systems and that may be why those in Ayurveda may be less inclined to scientifically investigate how these medicines work. Amma, however, strongly encouraged further research in Ayurveda as a means to bring the communities together and suggested studies with two arms – one where the patients are treated by Ayurveda and another where they are treated with modern medicine – for comparative purposes. She said initially we should take up simple single component medicines where research is easier. Amma went on to explain why Ayurveda, which was established in ancient times, was such a success. Modern medicines, which are often just chemicals, may provide immediate relief or cure but the chemicals destroy many other cells and therefore may cause a lot of side effects. 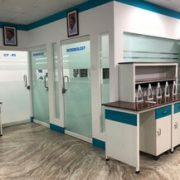 On the other hand, in Ayurvedic treatments, the medicines are natural herbs and there are no side effects and yet in many cases, they work very effectively. So we need to understand that for certain situations modern medicine may be necessary, but in many other situations, Ayurveda works better. She gave the example of old times when someone had a fever they inhaled steam and were given Tulasi which would cause them to sweat and eventually bring the fever down. Today we immediately administer antibiotics and this kills many good cells and has side effects. However, if the fever is too high then we may have to administer antibiotics, so we need to understand when to use what medicine and not be indiscriminate when we use medicines. Another doctor from Pune expressed a conflict. He said doctors are expected to be compassionate, yet there are others who say that a doctor has to be detached. How can we reconcile the two? 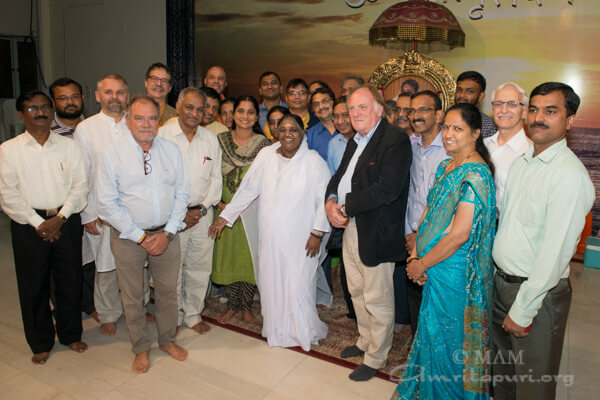 Amma said this conflict arises because we see others are different from us. When we see unity then there is no conflict because compassion and detachment then will not be seen as different. She said when one hand is hurt the other hand automatically caresses it yet is not attached to the other hand because both hands are part of one and the same person. Another doctor from Italy expressed concern that many children are experiencing depression and are committing suicide and whether Ayurveda can help. Here Amma felt that what is missing is that these children were never taught proper values very early in age nor did they have a loving environment where they could open their hearts. Then they become addict to drugs and alcohol. Once the problem reaches this stage it is difficult to do much except to try some medicines. She emphasized the importance of parents showing love and teaching values to children at an early age as the only way to prevent such casualties. Another doctor from Lucknow expressed the feeling that this was the best ‘scientific session’ of the conference!! 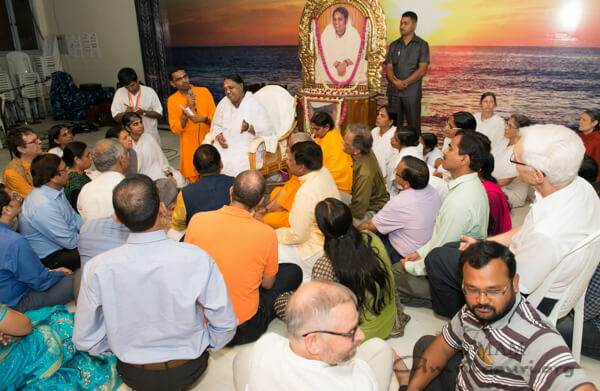 Amma blessed everyone with Prasad and every participant felt so full, saying words cannot express what they had felt in Amma’s presence.